NO PURCHASE NECESSARY. A purchase does not increase your chance of winning. 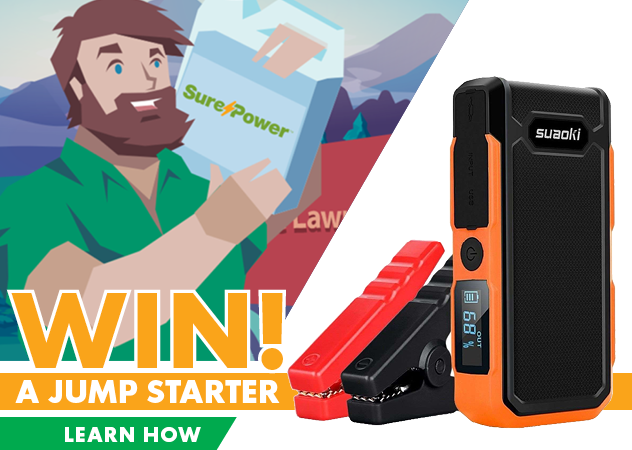 One Suaki U10 Jump Starter will be awarded at random. No cash or other prize substitution permitted. Must be at least 18 years old to enter. Void where prohibited. Sponsor employees, affiliates, subsidiaries, advertising, promotion and fulfillment agencies, show exhibitors, and other show staff are ineligible to participate. Winners will be determined via a random drawing on January 31, 2019. Winner will be notified via email within one week after the drawing. Entrants may check Nufarm social media to see if they have won. Unclaimed prize will be awarded to a winner selected via random drawing after February 1, 2019. Winner of unclaimed prize will be notified by email. Odds of winning will be determined by the number of eligible entries received. Sponsor, its employees, officers, directors, shareholders, agents, representatives, parent companies, affiliates, subsidiaries, advertising, promotion and fulfillment agencies, and legal advisors, are not responsible for and will not be liable for (I) electronic, hardware or software program, network, Internet or computer malfunctions, failures or difficulties of any kind; (II) failed, incomplete, garbled or delayed computer transmissions; (III) any condition caused by events beyond the control of Sponsor that may cause Sweepstakes to be disrupted or corrupted; (IV) any injuries losses or damages of any kind arising in connection with or as a result of the Sweepstakes, or from participation in the Sweepstakes; or (V) any printing or typographical error in any material associated with the Sweepstakes. Entrants agree to release and hold Sponsor, its employees, officers, directors, shareholders, agents, representatives, parent companies, affiliates, subsidiaries, advertising, promotion and fulfillment agencies, and legal advisors, harmless from any and all losses, damages, rights, claims and actions of any kind in connection with the Sweepstakes, including without limitation, personal injury, death and property damage, and claims based on publicity rights, defamation or invasion of privacy. This sweepstakes is in no way sponsored, endorsed or administered by, or associated with Suaoki. Sponsor reserves the right to, without prior notice and at any time, terminate the Sweepstakes, in whole or in part, or modify Sweepstakes in any way, should any factor interfere with its proper conduct as contemplated by these Official Rules.